"Line (music)" redirects here. For the line or tune of a piece of music, see Melody. Not to be confused with the composer Arvo Pärt. A score with four parts, for Mendelssohn's opus 13 string quartet. A bar from J.S. Bach's "Fugue No.17 in A flat", BWV 862, from Das Wohltemperierte Clavier (Part I), an example of contrapuntal polyphony. Play (help·info) The two parts, or voices, on each staff may be distinguished by the direction of the stems. Part-writing (or voice leading) is the composition of parts in consideration of harmony and counterpoint. In the context of polyphonic composition the term voice may be used instead of part to denote a single melodic line or textural layer. The term is generic, and is not meant to imply that the line should necessarily be vocal in character, instead referring to instrumentation, the function of the line within the counterpoint structure, or simply to register. The historical development of polyphony and part-writing is a central thread through European music history. The earliest notated pieces of music in Europe were gregorian chant melodies. It appears that the Codex Calixtinus (12th century) contains the earliest extant decipherable part music. Many histories of music trace the development of new rules for dissonances, and shifting stylistic possibilities for relationships between parts. Part writing is derived from four-voice chorales written by J.S. Bach. The late baroque era composer wrote a total of 371 harmonized chorales. Today most students' reference Albert Riemenschneider's 1941 compilation of Bach chorales. In musical forms, a part may refer to a subdivision in the structure of a piece. Sometimes "part" is a title given by the composer or publisher to the main sections of a large-scale work, especially oratorios. For example, Handel's Messiah, which is organized into Part I, Part II, and Part II, each of which contains multiple scenes and one or two dozen individual arias or choruses. Other times, "part" is used to refer in a more general sense to any identifiable section of the piece. This is for example the case in the widely used ternary form, usually schematized as A–B–A. 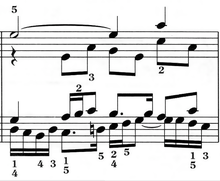 In this form the first and third parts (A) are musically identical, or very nearly so, while the second part (B) in some way provides a contrast with them. In this meaning of part, similar terms used are section, strain, or turn. ^ a b Drabkin, William. "Part (i)". Grove Music Online. Oxford University Press. Retrieved 10 August 2017. ^ Drabkin, William. "Part (ii)". Grove Music Online. Oxford University Press. Retrieved 10 August 2017. One frequently distinguishes the outer (highest and lowest) parts (Ger. Aussensatz) from the inner (middle) part or parts. ^ Van der Werf, Hendrik (1993). The Oldest Extant Part Music and the Origin of Western Polyphony, p.vii. H. van der Werf. ^ Starr, Eric (2009). The Everything Music Composition Book with CD, p.171. ISBN 978-1-60550-093-5. ^ Shepherd, John (2003). Continuum Encyclopedia of Popular Music of the World, p.257. ISBN 978-0-8264-6322-7. ^ Drabkin, William. "Part (iii)". Grove Music Online. Oxford University Press. Retrieved 10 August 2017. The primary division of certain large-scale works (especially oratorios), equivalent to the act in theatrical works. ^ "part". Oxford Companion to Music. Oxford University Press. Retrieved 10 August 2017. In certain large-scale genres, e.g. oratorios, ‘Part’ is used to designate the main division of the work. ^ Drabkin, William. "Part (iii)". Grove Music Online. Oxford University Press. Retrieved 10 August 2017.